Michael has been so busy working on the bus every chance he gets. The pictures don't give any justice to the amount of time he has put into this. For every picture I take there are hundreds of steps in between to make this come together. 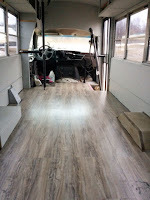 The Allure floor is finished (we chose Vintage Oak Grey) and carpet was used at the very front under the driver seat area. 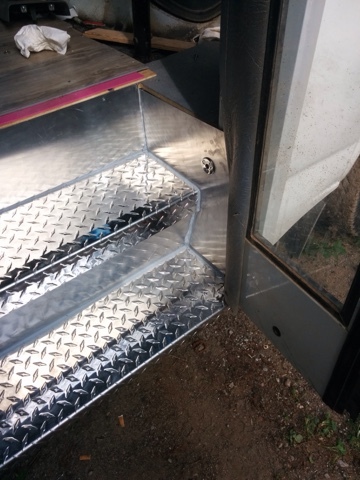 He recovered the steps with 1/8 aluminum check plate and it looks awesome! 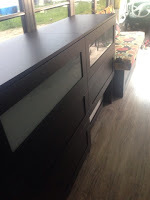 While it was too cold to work on the bus he designed the bench seats and drawers and customized the IKEA dressers that we bought to fit over the wheel wells. By the time those were all painted it was warm enough to start painting inside the bus and finish the shelves over the windows. We custom ordered acrylic doors and he installed them when they were ready. Yesterday we moved all the furniture into the bus and Michael will be finished mounting it by the end of the day! 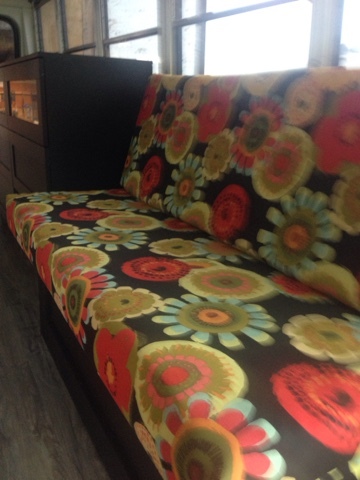 A good friend of mine upholstered the foam cushions (another IKEA purchase) for the seats/bed so the bus is starting to really look like a living space. But there is still so much to do! 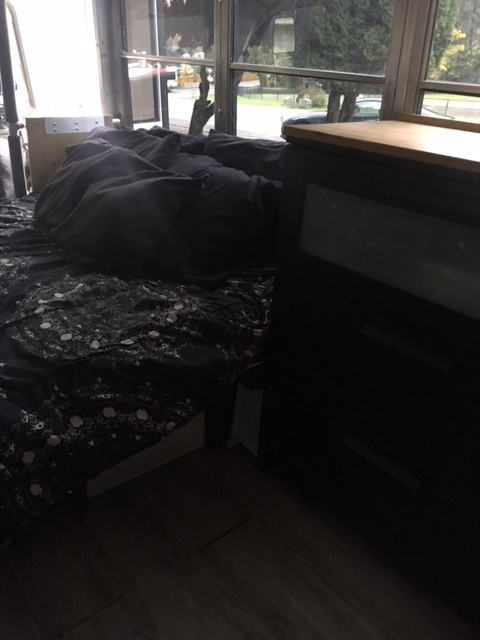 The sink still needs to be installed (we are just using portable camping shower bladders as our water tanks) and we have a camp toilet that isn't a permanent fixture yet. All of the LED lighting still needs to be installed and we haven't even purchased the inverter or the stove/barbecue yet. We had the windows tinted and Michael painted outside window frames black. 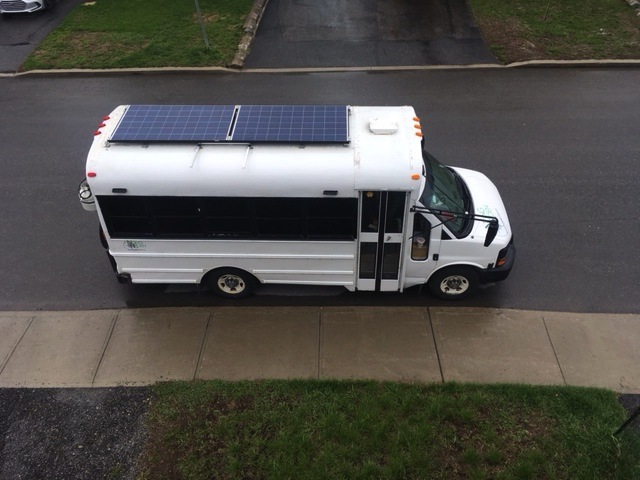 I was pretty skeptical on how that was going to turn out but it looks amazing and gives the bus a more modern look. 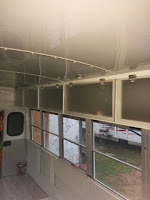 The next big job is to paint the rest of the bus exterior white. 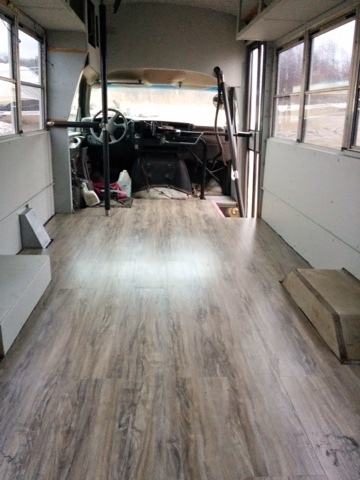 I'm so excited that the bus is almost ready! The first trip is going to be to go visit my daughter in Ottawa! I can't wait!